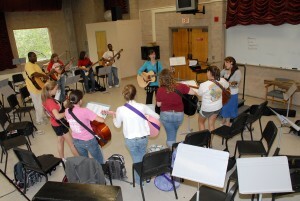 Welcome to the Music Therapy Program at The University of Alabama! We are the only program in the state to offer a bachelor of music degree in music therapy. Upon completion of the BM in music therapy, students are eligible to sit for the Music Therapy Board Certification Exam. Music therapy is the “clinical and evidence-based use of music interventions to accomplish individualized goals within a therapeutic relationship by a credentialed professional who has completed an approved music therapy program” (AMTA, 2016). We are the only program in the state to offer a bachelor of music degree in music therapy. Upon completion of the BM in music therapy, students are eligible to sit for the Music Therapy Board Certification Exam. Learn about our program and frequently asked questions about music therapy.